Casa Aleixo, Rui Barreiros Duarte, ink on paper, 2012. 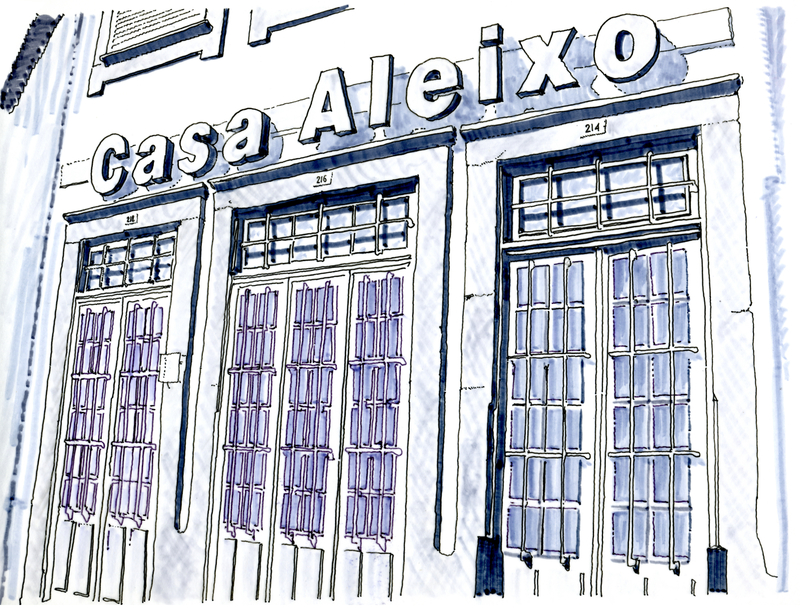 Casa Aleixo’s granite walls have welcomed diners for over one hundred years. This restaurant was first a “tasca,” a place that serves cheap wine and snacks. When it changed hands, in the 1950s, the new owners perfected a small menu of dishes prepared with the best ingredients they could find in the Póvoa do Varzim market. The quality and consistency of the food quickly attracted a loyal following. Aleixo’s owners use whimsical names to describe different parts of the restaurant: lab for the kitchen, surgery room for the dining room, pharmacy for the wine cellar, and torture chamber for the cashier. At Aleixo you can eat perfect laminated octopus, tender whitefish fillets, and succulent roasted veal. And, since prices are reasonable, you can go through the torture chamber without enduring much pain. Casa Aleixo, Rua Estação 216, Oporto, Tel. 225 370 462. This one I strongly recommend! It’s in my hometown, but I didn’t know its history! Congrats Sérgio! It’s always good to have a local confirm the recommendation. Thanks!